It’s important to note that as we age, naturally the elasticity and glow of our skin will start to dimmer. If you’re looking to reverse the signs of aging and improve your skin’s appearance, there’s a 4-product process that can do just that. The Core 4 Skincare Program is made up of 4 medical-grade skincare products to incorporate into our daily routine to rejuvenate your skin. These include growth factors (which we’ll talk about today), retinol/exfoliant, antioxidants and sunscreen. The best part? This system is clinically published and tested with results that prove its purpose with astounding results. At its core (see what we did there? ), growth factors improve the communication between cells in our body to naturally increase cell production. From here, your skin is prompted to turn over skin cells, creating cellular repair that can actually reverse the signs of aging. 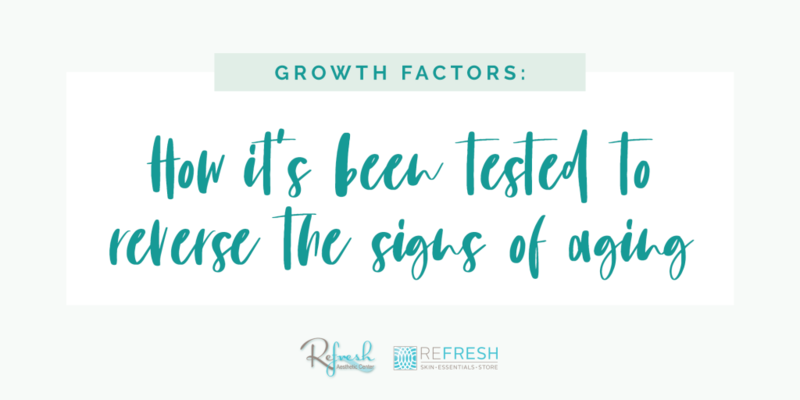 According to the Prime Journal, this is the most important advancement in aesthetics when researching the signs of aging; simply adding growth factors into your daily skincare routine. Ultimately, using recovery serums such as TNS Essential Serum or TNS Recovery Complex in your daily routine, you can slowly turn over cell count and reverse aging signs you may have seen for years. This can take upwards of a year to fully turn over, while small results can be seen in the first few weeks. Some believe that you can’t actually reverse the signs of aging, only maintain the skin you have in its current state. Based on current science, it’s entirely possible to reverse and rejuvenate the skin you have. While “reverse” can be an intimidating word, this simply means improve the current state of your skin from the inside out, and ultimately provide results showing healthier-looking skin. In some skincare products, the growth factor can be so low that you never actually see improvement in your skin. That’s why it’s important to invest in high-quality products that actually create the cell turnover you need to see it working. We recommend using TNS Essential Serum and TNS Recovery Complex in your daily routine to rebuild, stimulate and repair collagen in your skin. This will reduce the appearance of fine lines and wrinkles and improve elasticity in your skin. These products have 93.5% growth factor so you can see results quicker than any other anti-aging serums on the market. Whether you’re looking to prevent or improve the signs of acting, using this type of skincare routine is going to benefit your lifestyle. Make sure to check out the products we carry at Refresh, and ask our staff next time you’re in!